You are looking at the magnificent west coast sea nettles in the Aquarium of the Pacific in Long Beach. West coast sea nettles are a type of jelly, an invertebrate made up mostly of water. 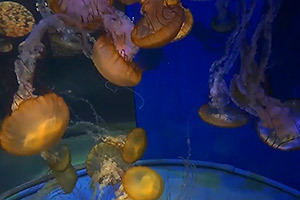 Jellies have no heart, brain or bones.